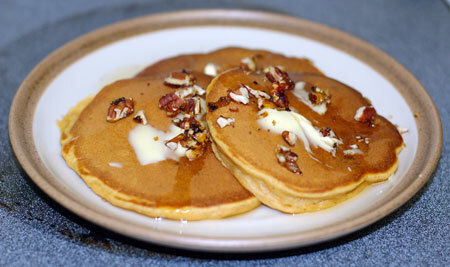 We made these for breakfast after Thanksgiving, using vanilla sweet potato puree leftover from the big meal. They have a very light sweet potato flavor, subtle enough that I actually liked them a lot. They also came out almost tender and fluffy enough to rival the famed ricotta praline pancakes, without even whipping the egg whites (it’s something to try sometime, though). I used cinnamon, nutmeg, ginger and cloves to sub for the pre-mixed pumpkin pie spice. These were well appreciated by Jeremy with some thick local bacon fried up in the cast iron skillet. Update 8/30/07: I made a batch of pancakes last night using some leftover vanilla-sweet potato puree from a pork tenderloin dinner earlier this week. They were just as good as I remembered. Used up the very last of my pecans, and caramelized half of them for garnish using a chunk of hard caramel leftover from my DB milk chocolate-caramel tart decorations (remelted it, sprinkled on the pecans, and tipped it over onto my Silpat). I ate three, Jeremy had two platefuls, and we still had four left for a lunch or breakfast.